It was down in a salley garden where me and my true love did meet. Saying, “Love, tell me the reason Oh why you were so severe. And it’s not the time to go, boys, for to go my boys, to go away. It’s not the time to go, brave boys, we’ll boast about it until day. But she felt so proud and sassy she would not take one drop from me. She bade me take love easy and not be so severe. She bade me take love easy like the dew drops falling off yonder trees. Oh landlady, my darling, come fill us one bottle with speed. I will pay you to a farthing, my darling indeed, indeed. Here’s a health to all my sweethearts who cause my poor heart to bleed. But now my pockets are empty and most of my credit’s out. And now’s the time to go, boys, for to go my boys, to go away. I had an amazing week researching traditional songs collected in the Upper Midwest at the American Folklife Center in Washington, DC at the end of last month. This month’s song comes from the AFC’s incredible holdings of material collected in Beaver Island, Michigan. Beaver Island was once a stronghold of Irish traditional song thanks to a high concentration of families with roots in the island of Arranmore, County Donegal (see N.S. Apr. 2013). The AFC has two sets of recordings made on Beaver Island: one was made in 1938 by Alan Lomax, the other was made in 1940 by Ivan Walton. Both collecting trips focused on largely on one singer, John W. Green (1871-1964), who had a remarkable repertoire of over 200 songs. Green sang “Down in a Salley Garden” for both collectors and the above transcription is a composite of the two versions as sung by Green. Green’s singing is characterized by very short phrases and odd breaks that may have resulted from him being short of breath. Still, I like the effect in some spots and marked all the breaks in my transcription. 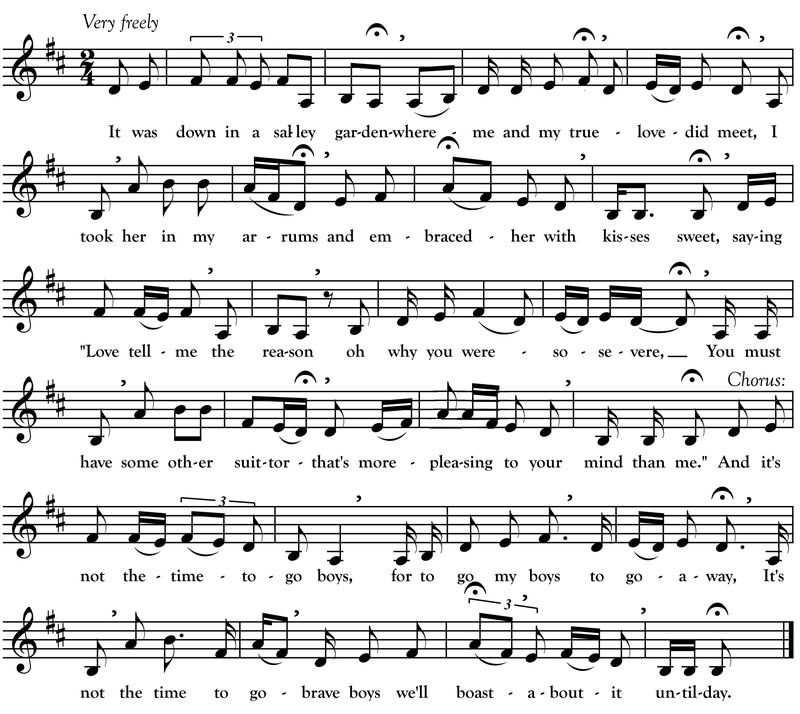 Though the song does share some poetry with the more famous “Sally Gardens” song, it is quite different in both form (it has a chorus) and sentiment.